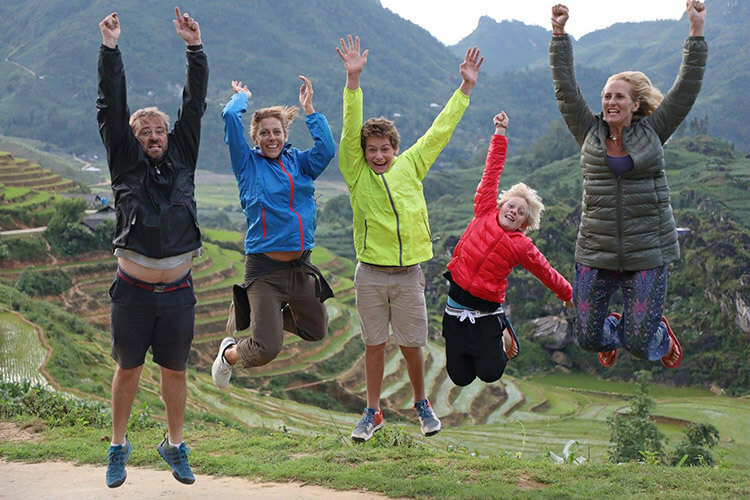 So a quick hop across to Hanoi in Vietnam to meet up with our dear friends, Carin, Michael and their son, Bash. What an incredible spoil to be able to meet up on the other side of the earth, midway between both of our extended travels. Them on a 6 month trip around the world and us puttering around South East Asia. 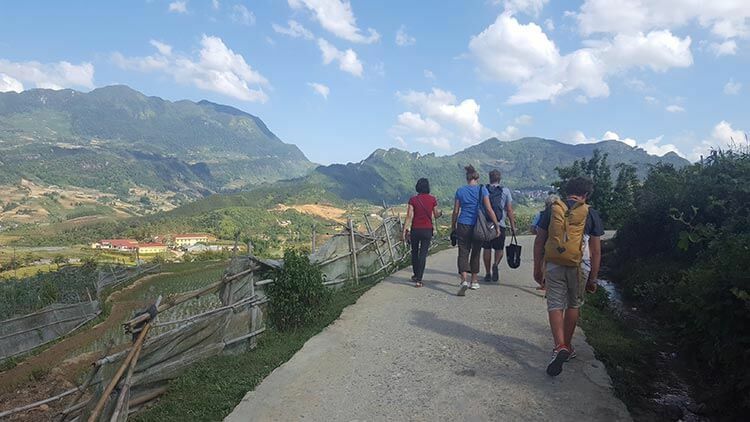 We’d barely dropped our bags and we were off – this time for some trekking in Sapa. The 5 hour drive there was the perfect time to have a really good catchup and there was wifi in the car so the boys were in their element connecting to each other on Minecraft. 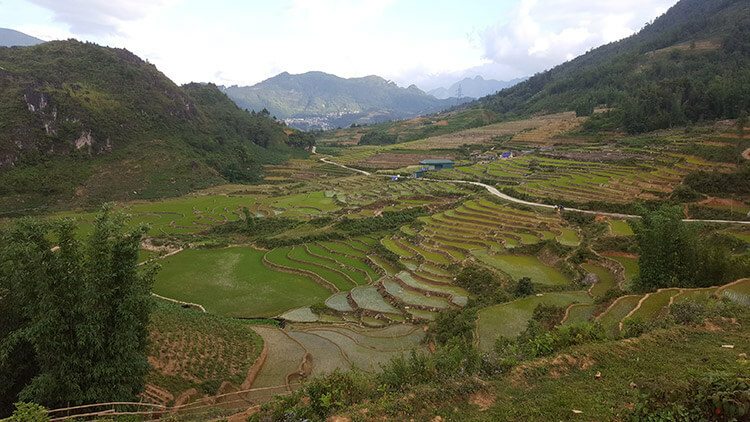 And then we got to Sapa and WOW! 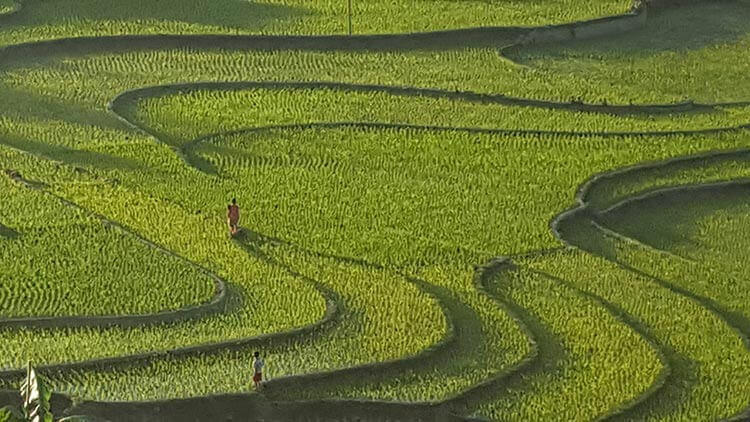 The hills and valleys terraced from top to bottom with rice paddies of every green you can imagine. 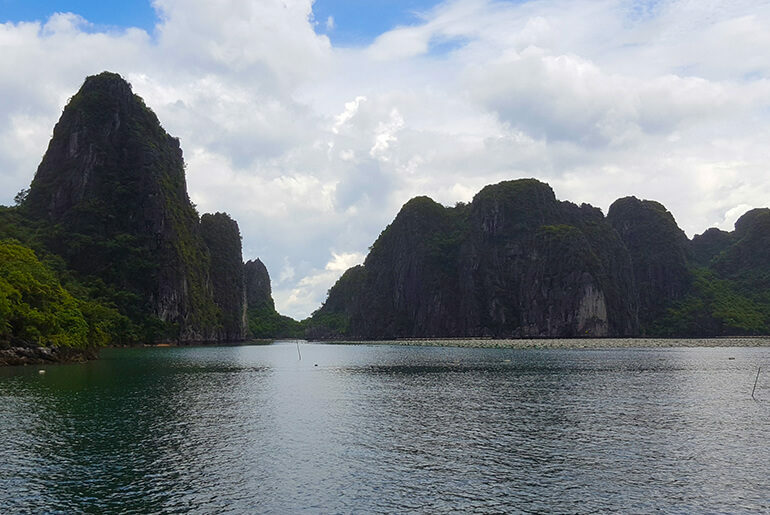 The scenery was simply spectacular! 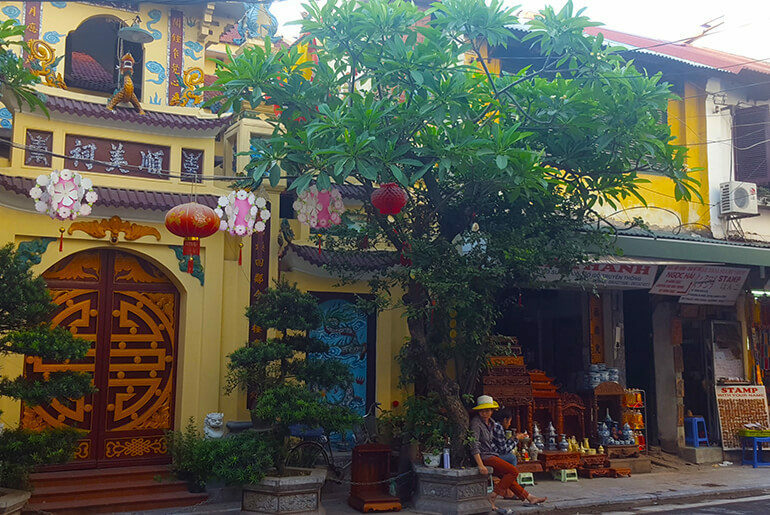 Carin had found us a highly recommended guide by the name of Hong. She was a tiny little thing, full of energy, with a truly inspirational story of finding her voice in a very male dominated society and believing that whatever a man could do, she could do too! 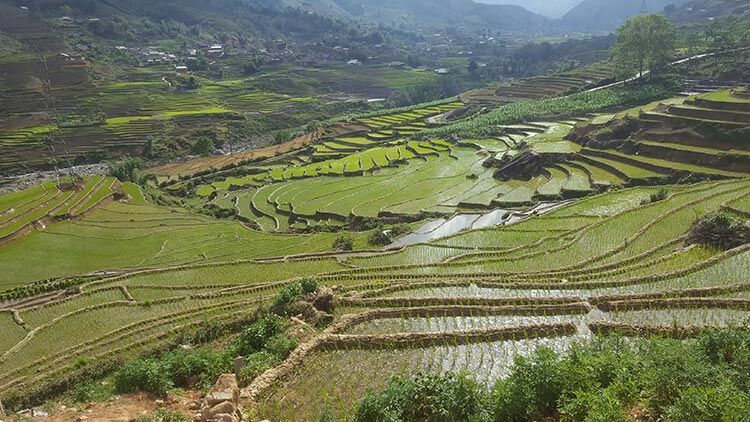 She divorced her lazy husband, became the first female motorbike taxi driver in Sapa and now does private guiding for tourists in Sapa. Recently married to her Dutch husband, they are busy converting their house to a homestay for future guests. 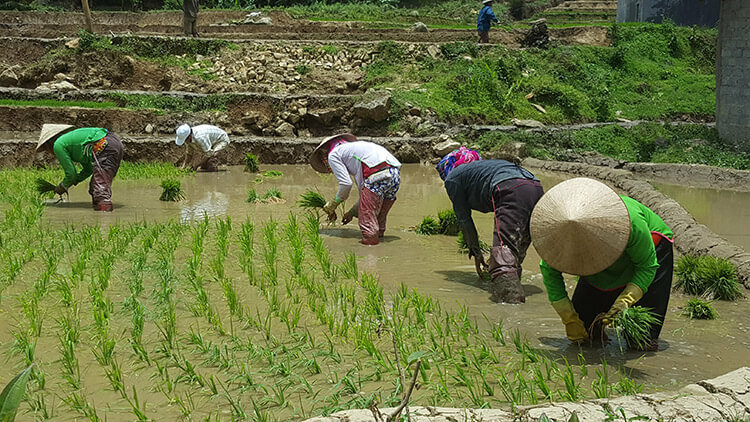 After a quick coffee, we all jumped on motorbikes and went cruising past the rice paddies, through Sapa town and high up the mountain. A quick stop on the side of the road for a BBQ lunch of sticky rice in bamboo, BBQ’d eggs, pork kebabs, tofu and sweet potatoes with chili salt. 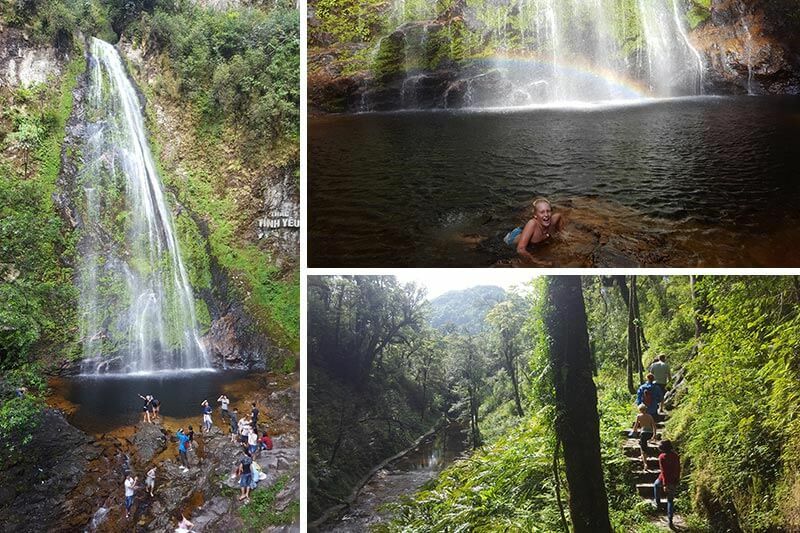 Then it was time for short hike through a lush valley to the Love Waterfall, where Tai took an icy plunge and tried to get some Chinese tourists to pay to take a picture of him. With his blonde hair and blue eyes, Tai constantly has Asian people asking to take a photo of him, so instead of getting irritated, he’s turned it into a game, where he asks them to pay him for the privilege. This usually leads to laughter all round and he’s yet to earn a cent! 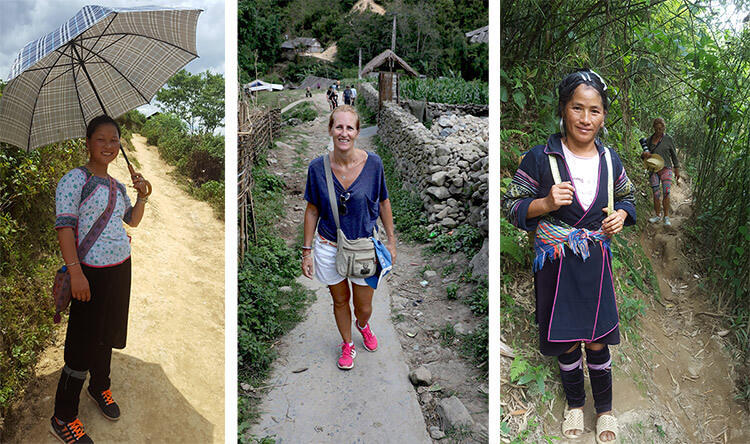 We spent our first night at the home of a Red Zong tribe family. LeMay was delightful and kept the rice wine flowing! We learnt to say cheers “pointy hen”, drink “dope” and all done “get sick” – well that’s what it sounded like! After our delicious dinner, we were treated to medicinal baths in wine barrels. Drinking rice wine with LeMay and a medicinal bath in a barrel! Back on our bikes the next day and a treacherous drive out of the valley and down into the next valley where we would be staying with a family from the Black Mong tribe. Mi was our guide for the day and took us for a meandering walk through various villages, through bamboo forests and along mountainous footpaths with sweeping rice paddies terraces as far as the eye could see. On the left is Mi, our guide and on the right is a local woman who joined us for a bit tried to sell us her handicrafts. It was boiling hot and yet they both were wearing traditional clothes which included thick velvet wrapped around their legs!Hong fetched us the following morning, with another harrowing drive out of the valley, a wander around the village and a stop at the market to buy food for lunch. The cooked dogs head lying on the counter didn’t go unnoticed, so we all decided to go vegetarian for the day! Another delicious meal prepared by Hong and sadly, it was time to leave. 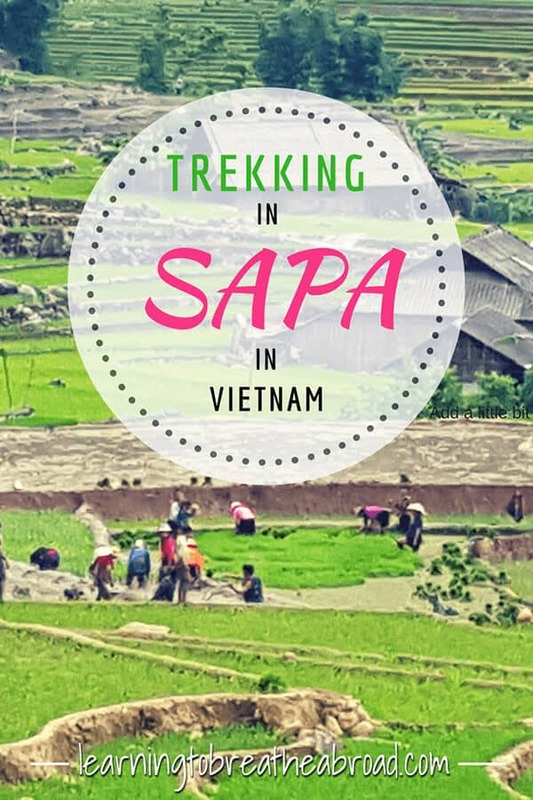 There are hundreds of trekking companies in Sapa, but I doubt any of them would give you the kind of customised tour that Hong provided for us. She asked lots of questions before we got there, about what we would like to do and then custom designed a trip that suited us best. 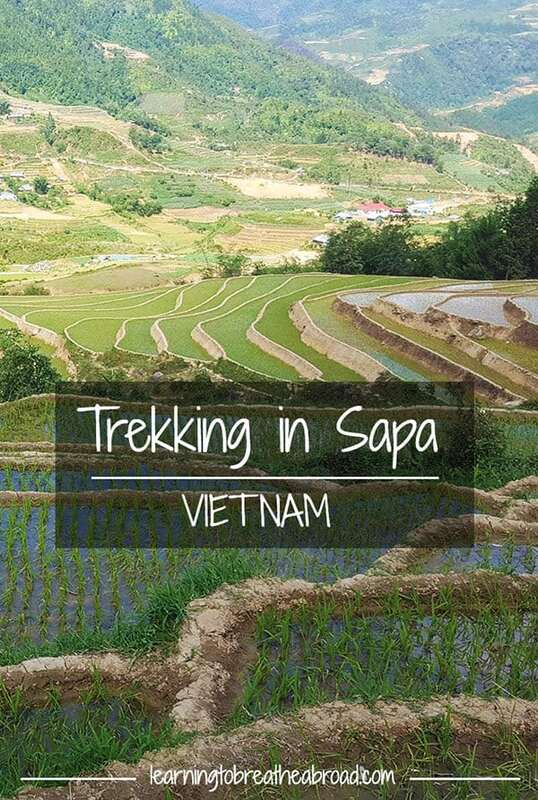 I would highly recommend Hong if you are going to be trekking in Sapa!